reworked the sync between the device and the website. Please let me know if you continue to experience any issues with the syncing. addition of a very simple Wendler calculator. There are two ways to access the new Wendler calculator. 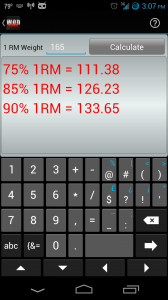 From the calculator button on the initial screen. From your personal records list. Note that your PR results must only contain a number. If it contains any text, then you’ll get an error message on the Wendler calculator screen. When you click on a PR in the above list, an action bar will present itself. On the far right of the action bar, is a calculator icon. 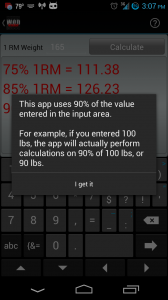 Clicking on this icon will display the new Wendler calculator. In this iteration of the Wendler calculator, only 90% of the value entered into the will be used in the percentages found in the list below the 1 rep max (RM) value. In a future update, I plan on adding multiple percentage classes. This version will only calculate 75%, 85% and 90%. I’m not a Wendler expert, so I may be missing something from the calculator. If you notice anything, please don’t hesitate to email me or use the contact form found on the blog.